Due to its geography, Norway is challenged with long distances between hospitals and patients, especially in the North, so the national process of routine telemedicine adoption has been in progress for two and a half decades already. Based on the 2014 study conducted by the Norwegian Centre for Integrated Care and Telemedicine and University Hospital of North Norway, telemedicine is going through its final stage of wide adoption across Norway, but its actual routine usage is still rather low, comparing to the stated potential. In the course of the study, two different approaches for gathering statistics of telemedicine usage were used: one was based on the technology type or modality (i.e. both synchronous and asynchronous services) and the other one was based on the nature of consultations. Both approaches allowed shedding some light on the regional and institutional levels of telemedicine adoption throughout the country. The study reveals that at the regional level telemedicine consultations and services are mostly used in Northern Norway (around 54% of all outpatient consultations included telemedicine episodes), followed by Western Norway (around 45%). On the other hand, telemedicine usage rate in Central and South-Eastern Norway accounts for only less than 1%. Are you looking to build a telemedicine solution and in need of professional help with future-proofing, prototyping and software development? At the institutional level, telemedicine adoption goes up to 68% throughout Norway healthcare facilities. This result was based on the consistency of usage, the amount of telemedicine projects launched and the percentage of telemedicine users covered. 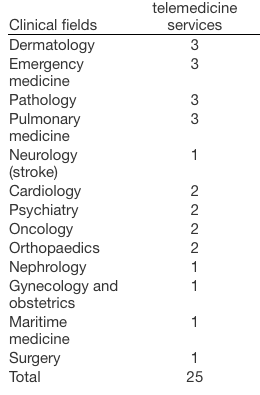 According to the same study, neurosurgery was the main healthcare specialty for telemedicine episodes. It was also stated as a “clinical area with a relatively high use of telemedicine compared to the total number of outpatient visits". Other areas of telemedicine usage included skin and venereal diseases, physical medicine and rehabilitation, cardiovascular diseases, eye diseases and orthopedics. However, note that this data varies in relation to the clinical specialties of the surveyed hospitals and healthcare institutions. The most popular and, therefore, the most widely used telemedicine service is videomedicine. Mass adoption of telemedicine benefits the national healthcare both economically (reduced travel costs, sick leaves, number of hospital admissions and time spent by health practitioners) and qualitatively (time management, decision making, patients’ satisfaction level and easy access to professional expertise). At the same time, the study outlined the major implementation barriers including contextual, organizational and policy issues in healthcare facilities and clinical practices. Yet, the largest impediment is insufficient reimbursement policies as a form of incentive and telemedicine driver for health professionals. The most promising opportunities for further development of telemedicine in Norway lie in eHealth software solutions. By providing patients and medical professionals with high-quality communication channels, both secure and efficient, Health IT / MedTech companies are able to create sufficient use cases to innovate the entire system of Norwegian healthcare and get buy-in for implementation from the old-school decision makers. Have you ever used telemedicine services and if yes, what has your experience been so far? Iryna is a freelance copywriter and internet marketing geek. Started 7 years ago in health insurance, developed to B2B investment company, currently exploring marketing field for full SDLC companies.